In my review of Reeder 3.0, I mentioned how the app's implementation of Fever doesn't allow you to specify a time range to fetch Hot Links. In the way I use Fever, in fact, the possibility to use the app as a way to catch up on important news -- rather than constantly checking for updates throughout the day -- is a fundamental advantage over standard Google Reader and third-party Reader clients. I recently took a week off the Internet, and relied exclusively on Fever and Flipboard's Cover Stories to keep up with the most important news I cared about. Being able to set a time range in Fever's Hot Links is becoming a must-have for me. Sunstroke by Gone East delivers on the need of a full-featured Fever client for iPhone with solid sharing options, a good interface, and proper Hot Links support. I recently started using Sunstroke as my main Fever client on the iPhone, and I have been very pleased with its results and integration in my workflow. More importantly, Sunstroke concretely allowed me to keep up on the news thanks to its time range-based Hot Links, providing actual tools to filter news I had missed by time period, thereby ensuring I could be brought up to speed on relevant items no matter my absence. Visually speaking, Sunstroke offers a fairly familiar Fever experience. The main screen hosts Hot Links, Kindling, Saved, and Sparks sections, enabling you to switch between read/unread items and groups configured in your Fever account. I found refresh times to be slightly faster than Reeder's -- albeit it's worth mentioning how Sunstroke comes with entirely different settings for managing Fever sync. You can set the app to "sync automatically", delete items after 2, 4, 6, or 10 weeks, and auto-mark items as read as you scroll. This last feature is extremely well done, with smooth scrolling when skimming through hundreds of subscriptions on my iPhone 4S. Overall, I like Sunstroke's sync indicators and custom icons in the main screen of the app. 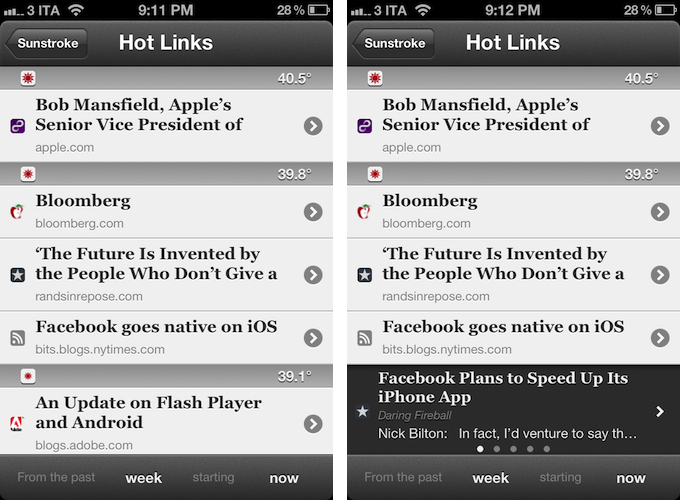 Where Sunstroke really shines is the Hot Links list. Unlike Reeder, a bar across the bottom of the UI lets you display Hot Links "from the past" few days, weeks, and month "starting" now, yesterday, and up to 5 weeks ago. This feature alone made purchasing Sunstroke worth it as it offers a solid yet simple way to set the time range according to which Fever's hot items will be displayed. Per Fever's typical presentation, hot items are sorted by "temperature", and grouped by site. Sunstroke stores every item from the Fever database on your device, which means every link that contributes to a link's hotness can be viewed inside the app. This means that a) you can go offline and still tap around links and read articles through Fever's own mobile viewer (though you can also use the Instapaper mobilizer) and b) you can tap & hold on a hot link to load related items as a swipeable "gallery" inline. The latter option is particularly attractive and well-implemented; my only issue is with the way Fever often cuts off headlines from hot links, but that's not Sunstroke's fault. I found Sunstroke to be very polished in other areas, too. In the settings, you can tell the app to hide unread counts and show newest items first, or to cache images on WiFi-only while also setting a specific cache size. 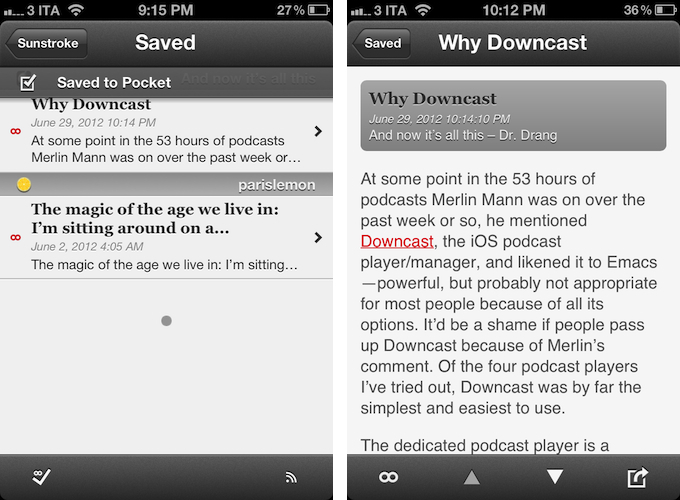 The app supports sharing through a dedicated sharing button and by tapping & holding any link, and the sharing options include Facebook, Twitter, Pocket, Sparrow, and Instapaper. Like Reeder, you can assign toggles for right/left swipe actions -- mine are, unsurprisingly, set to Pocket and "Toggle Saved", but you can also "Toggle Read". The notification for saved items is also nicely presented and elegant. Sunstroke is not perfect (the app crashed once in my tests; there is no iPad version for now; options to control font appearance and size would be welcome), but it undoubtedly is the most complete Fever experience currently available on the iPhone. Sunstroke has got good sharing options, great Hot Links implementation, a fast engine and navigation, and, overall, a feature set meant for heavy Fever users that outpaces Reeder's basic support for the service. 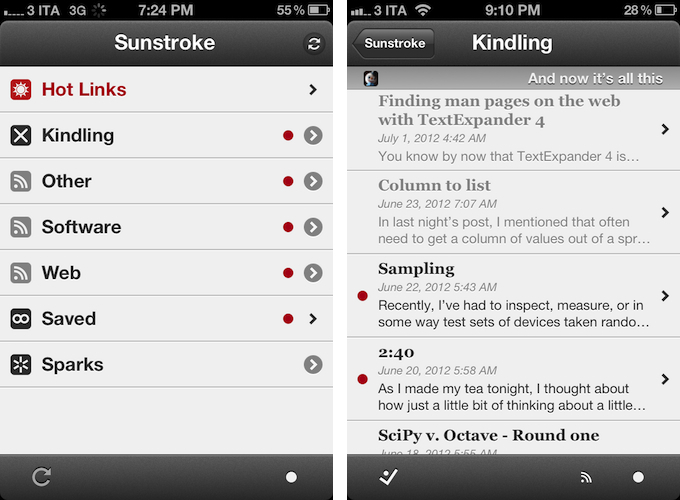 Fever users looking for a solid iPhone client need to check out Sunstroke, which is available at $4.99 on the App Store.